The American Civil Liberties Union has filed a lawsuit challenging Michigan's order prohibiting driver's licenses to young immigrants who qualify for the federal Deferred Action for Childhood Arrivals (DACA) program. The DACA program allows certain immigrant youth who came here as children – commonly known as DREAMers because of the proposed DREAM Act legislation – to live and work in the United Sates for a renewable period of two years without fear of deportation. An estimated 1.76 million youth in the United States are eligible for the DACA program, including about 15,000 in Michigan. The ACLU, NILC and other coalition partners already filed a lawsuit over a similar policy in Arizona November 29. Plaintiff Leen Nour El-Zayat, a third-year pre-medical student at Wayne State University, said she worries about continuing her studies and accepting a job if she can’t drive to school or work. 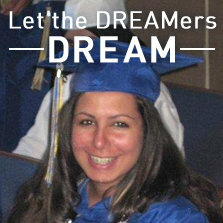 Leen came to the United States when she was eight years old. She and her family were living in the Democratic Republic of the Congo when war broke out, and came to the United States to escape the violence. Read more about Leen. The complaint asks for a ruling that DACA recipients are legally authorized to be in the U.S. and therefore eligible for licenses. The complaint further states that Michigan’s policy violates the Supremacy Clause of the U.S. Constitution by interfering with federal immigration law, and violates the Fourteenth Amendment’s Equal Protection Clause by discriminating against certain non-citizens. The case was filed in the U.S. District Court for the Eastern District of Michigan Southern Division. Victory! Michigan Lets the DREAMers Drive!